Designed to perform in the world’s toughest environments, the F90 delivers accuracy, reliability and adaptability when you need them most. Backed by 100 years of experience and manufacturing of weapons for Australian soldiers since WWI to the battlefields of today, the F90 is an entirely new bullpup automatic rifle design, an ideal platform to meet the needs of today’s top military forces. 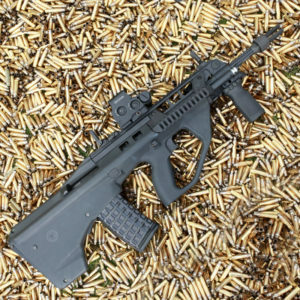 Its bullpup design for longer barrel length and optimum muzzle velocity delivers superior stopping power in a compact package. The F90 is one of the lightest assault rifles on the market at 3.25 kg, enabling fast reaction times and rapid target acquisition, a clear advantage in close quarters combat. NATO standard rails and NATO ammunition interoperability provide adaptability for a wide range of mission profiles. 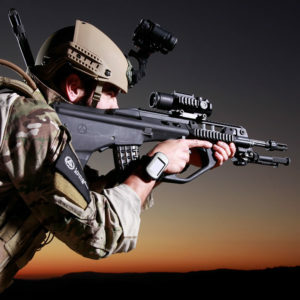 Packing a punch, the F90 includes an integrated side loading 40 mm grenade launcher that can be attached in just a few seconds by the soldier – a potentially decisive capability providing flexibility on operations. 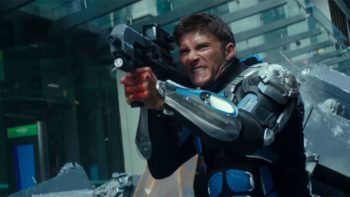 The grenade launcher itself is equipped with a lightweight robust quadrant sight that ensures rapid target acquisition, can be used at night, and is compatible with night vision goggles. Barrels lengths can be changed by operator in seconds allowing the F90 to be employed in CQB, standard and marksman roles. Even the longest barrel configuration F90 remains shorter than a generic M4 rifle with the stock extended. 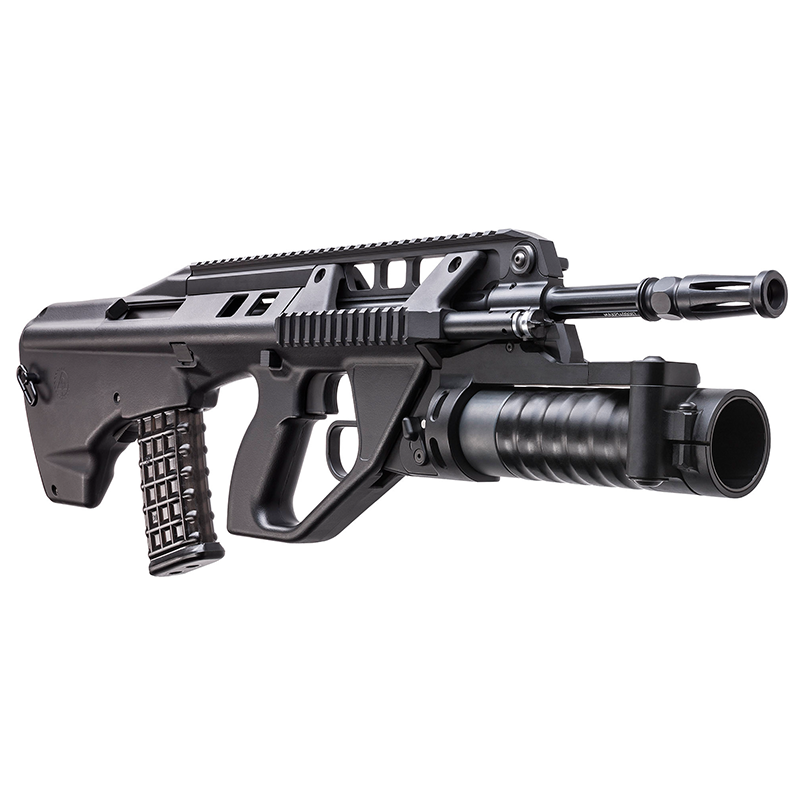 F90 can be supplied with one, two or three barrels. Each barrel retains it's three permenantly mounted Picatinny rails allowing barrel changes with optics and target aquisition accessories and furniture, retaining zero while varying ergonomics, instantly. Cerakote™ surface treatment provides a military customer the ability to order F90 in any catalogue colour or color scheme, including Cerakote™ GEN II Firearms Coatings with reduced near IR reflectivity. 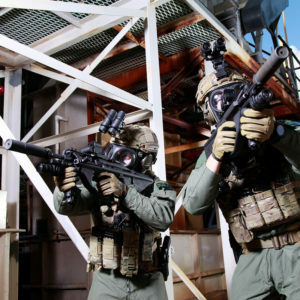 Through a large network of strategic partners Lithgow Arms can offer prospective military and law enforcement customers uniquely tailored systems-based solutions. Grenade launcher integration via lower rail interface allows instant, tool free fitment and removal, reducing weight and enhancing system flexibity. Non-reciprocating cocking handle folds flat against the receiver to reduce rifle profile while preventing fixed handle impact injuries. F90 requires no lubrication and minimum operator maintenance for reliable and consistant operation during sustained fire, even in the most adverse of conditions. Sliding, two stage, select fire trigger allows the operator to fire single shots or bursts at every sqeeze of the trigger. Ambidextrous safety available in two position (SAFE/FIRE) or three position (SAFE/SEMI-ONLY/FIRE) configurations. Porting allows cool air to flow through directly over the hottest parts of the barrel, helping control operating temperatures during high rates of fire. Enhanced buttstock profile dramatically improves ergonomics and cheek weld while reducing snag points. 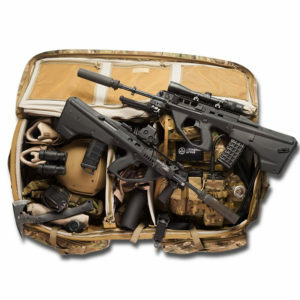 Unique to the AUG based rifles, the F90 case deflector allows safe and consistant offhand fire from cover. Ambidextrous webbing and clip style sling mounts allow multiple single and dual point sling configurations. Ambidextrous magazine release with mechanics that prevent accidental magazine release. 30 round high-reliability, polymer, translucent magazine provides a lifetime of reliable feeding while allowing operators to instantly judge magazine load. 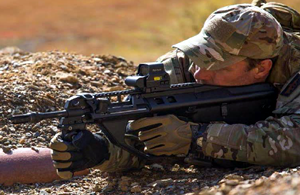 Integrated trigger and hand guard protects the operator's master hand from impacts in the battle environment. Short stroke gas piston with two position regulator ensures consistant reliable operation in adverse conditions. Enlarged and profiled ejection port broadens ammunition compatibility and enhances reliability in adverse conditions. Three Picatinny rails permanently aligned with bore axis allowing permenent co-witnessed mounting of target aquisition accessories. High accuracy, cold hammer forged, chrome lined and fluted barrel available in three different barrel lengths. 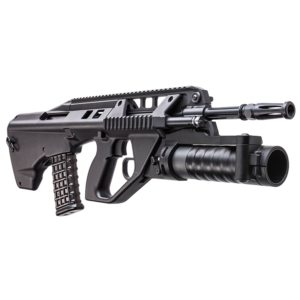 The SL40 grenade launcher was developed in parallel with the F90 rifle. Munition compatibility, system integration and ergonomics were nominated as the driving considerations for design. 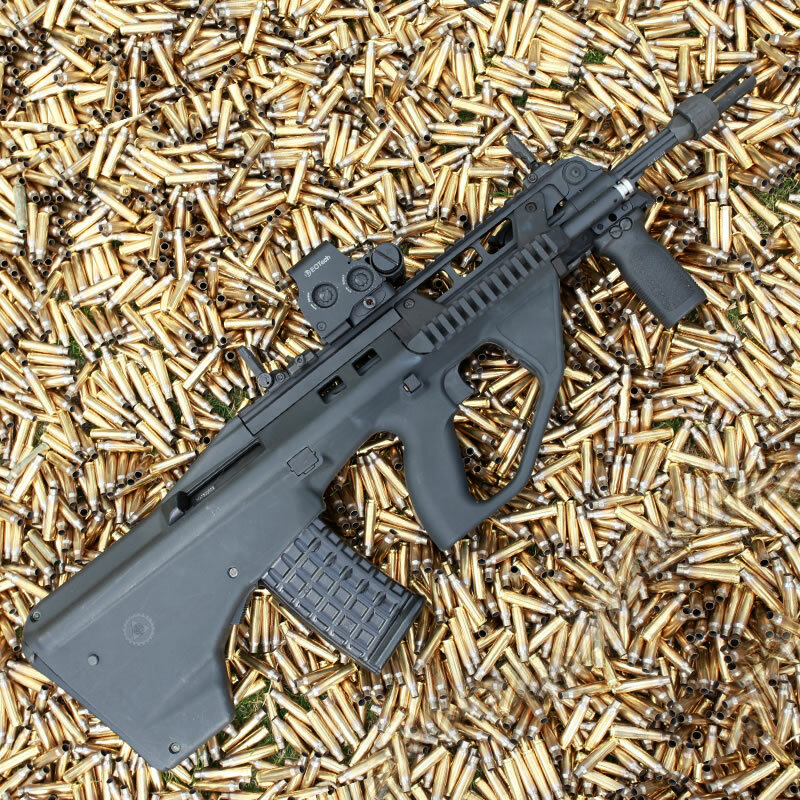 The completed prototypes was tested alongside the F90 as a critical element of the mission system, and successfully passed the same arduous test and evaluation trials as the rifle itself. The pairing of the SL40 grenade launcher and F90 rifle represents one of the most elegant system integrations available on the market. 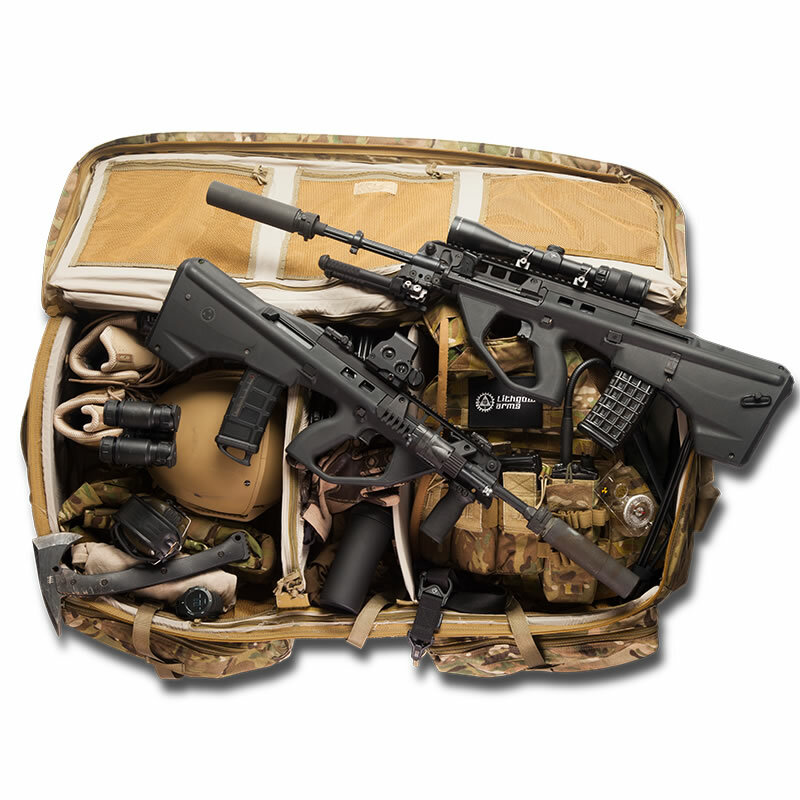 Co-located triggers allow operators to react instantly to emerging threats by dual firing the SL40 and F90 rifle. Complementing this, the SL40 grenade launcher Intuitive Grenade Launcher Sight enables rapid and accurate engagement of targets even while the firer is on the move. At just 1185 grams with sight, the SL40 is lighter than any comparable competition. Despite this low weight the SL40 is still equipped with a robust hammer forged steel barrel. The SL40 grenade launcher with holographic sight weighs only 1185 grams, making the SL40 one of the lightest grenade launchers available. Lithgow Arms maintains strategic arrangements with munitions manufacturers, and is co-developing airburst smart munitions compatible with the SL40. 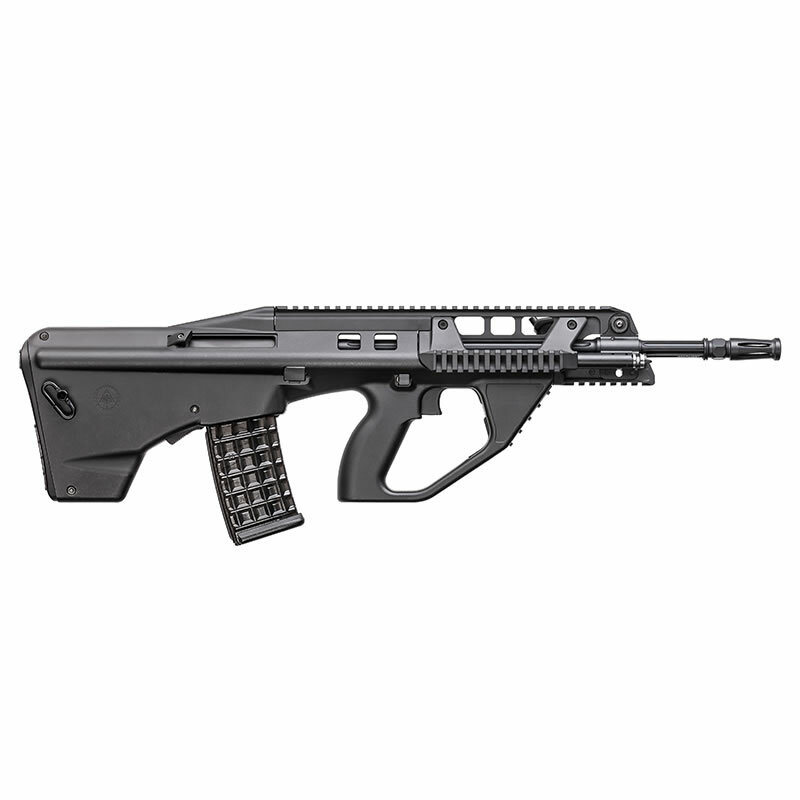 SL40 instantly integrates with F90 rifles without tools or parts. Simple integration mechanics minimise weight and maximise mission flexibility. 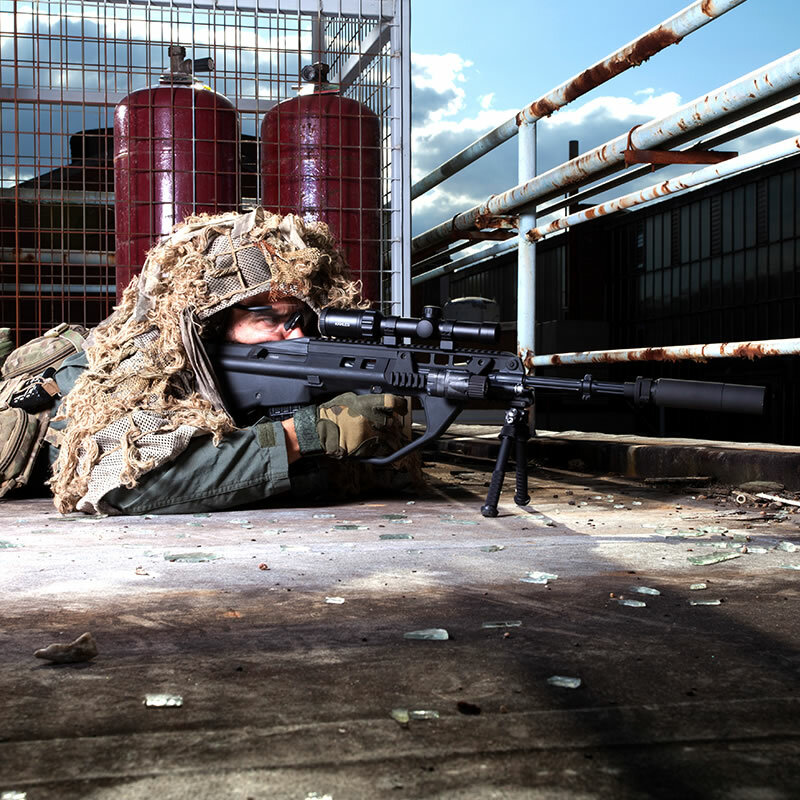 Standalone stock allows the SL40 to be employed by team members in a dedicated grenadier or fire support role. Toughened, quick fit grenade launcher sight with 7 MOA Trijicon holographic sight allows fast and accurate target acquisition without the difficultly or fragility of traditional plastic open sights. The snag-free, streamlined design will not get hung up or caught on webbing or equipment. 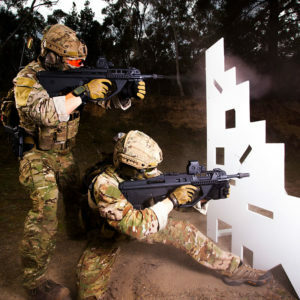 Lithgow Arms’ innovative Bullet Trap Blank Firing Attachment (BTBFA) is a small device that fits onto the end of a rifle barrel and safely captures bullets inadvertently fired during blank ammunition training. Reliable cycling of weapon during blank fire training is assured. In regular operation BTBFA lifecycle exceeds 25,000 rounds. The Lithgow Arms BTBFA is certified to operate at hot and cold temperatures in a wide range of environmental conditions. Durable, alloy steel design means soldiers can handle the weapon as it was intended without fear of breaking or damaging the attachment. Lithgow Arms BTBFA will capture up to five ball, tracer or armour piercing bullets. 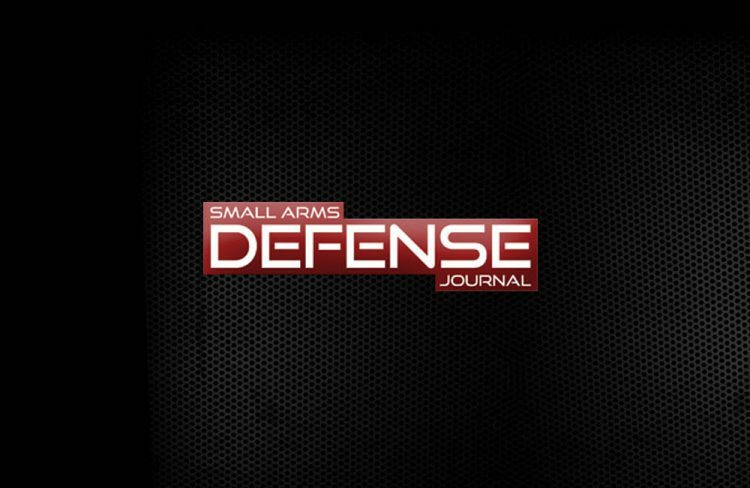 The BTBFA dramatically reduces the chance of serious injury to personnel or bystanders and, in combination with other measures, represents an effective and reliable contribution to weapon training safety. 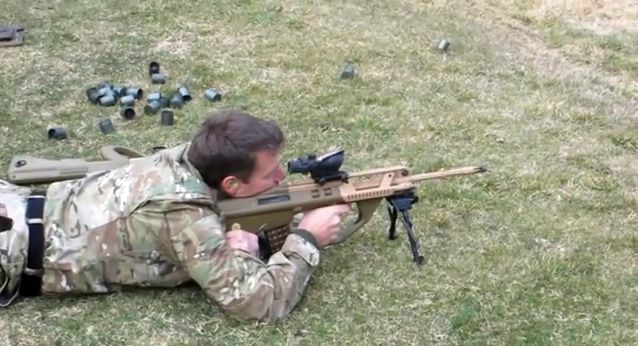 It is available for AR and AUG based platforms The technology can also be adapted to fit other weapons. BTBFA is available in screw on or quick disconnect fittings. 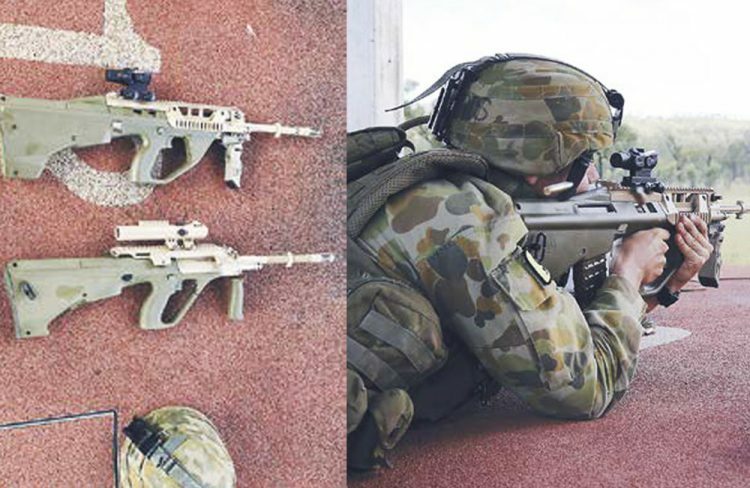 The BTBFA is currently in-service with the Australian Defence Force.